We have two showrooms situated within easy access for visitors in the North West of England and along the M4 corridor for those visitors based in Southern England & South Wales. Come see and feel the superior quality of our Outdoor Living solutions for yourself. Gain a better understanding of how our composite decking, artificial turf, outdoor tiling and balustrade systems work together to create the Complete Solution. Visit our Elite Outdoor Living showroom based at our Elite Balustrade Systems Ltd Head Office. 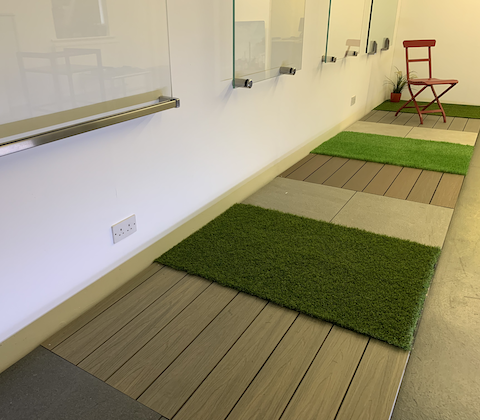 This showroom has an extensive display of compositing decking, artificial turf, outdoor structural tiles and a full range of glass balustrade designs. Meet our team who will be happy to discuss your options for your project needs. We even stock a range of decking and artificial grasses that can be bought and collected from the same premises. Based at the National Self Build and Renovation Centre in Swindon, Elite Outdoor Living have a full display of products located at Stand 144 within the Trade Village. Free to enter the visitor centre you can view the products first hand and learn more about the systems offered. You will also see many other complementary self-build products from many other suppliers and resources to help you with your homebuilding project. The centre has a help desk staffed by the centres own experts available to offer you support. You can also join one of various self-build courses held within the centres training facilities held throughout the year, or meet the Elite Outdoor Living team during one of the 3 weekends shows held in January, May and October. If you have any queries about our product range, please fill out and submit the simple form below and a member of our team will be in contact shortly. Fields marked with * are mandatory.